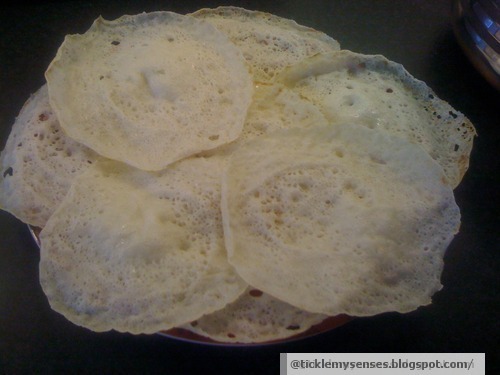 This soft and tasty dosa, is very simple to make. It uses ground rice and beaten rice/ avalakki/ poha. Its very simple to make as here I have made use of ready made Appam podi / Appam rice flour which is made of ground rice available in all Asian/ Kerala stores . If you cannot get hold of this ready made powder then raw rice can be used but needs to be soaked and ground to a paste with water and avalakki. I fried this batter in a appam pan. 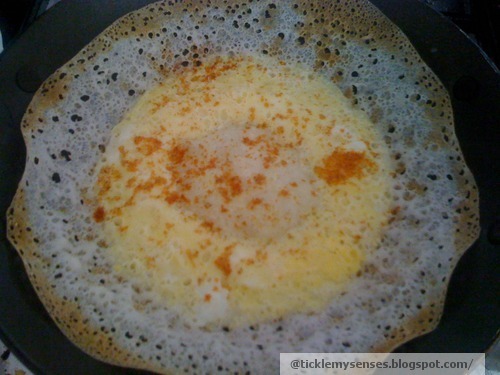 Serve with vegetable/ chicken/ mutton stew curry, or for breakfast with honey, or as an egg dosa(see picture) with a layer of beaten egg poured over the dosa, and allowed to cook for a further 1 minute before serving. 1. Take beaten rice in a bowl. Dissolve curd in 1 cup warm water and pour over the beaten rice. Cover allow the beaten rice to soak for half an hour. 2. In a blender take the soaked beaten rice, add the appam flour and sufficient warm water to make a fine dosa like batter. The batter should be medium thick. Pour out the batter into a fermenting vessel, add sugar, salt & yeast ( which has been activated in a bowl containing 1tsp sugar and 3 tbsps warm water). Mix well. 3. Ferment in a warm place for few hours or overnight. 4. Take a non- stick Appam pan and heat on medium- high flame. When hot pour a ladle of batter and make similiar to appam. 5. Cover with a lid and let it cook for about 2 mins. There is no need to turn over. 6. Remove the lid and lift the dosa out. Can apply a little oil to surface using a teaspoon. For Egg Dosa: Serves 1, makes 2 egg dosas. 1. Break the egg in a bowl, season with salt, chilli or pepper powder. 2. When pan is hot pour a ladle of dosa batter and let it cook for 30 secs then pour half beaten egg over the dosa, close pan and allow egg to cook. May take 3-4 minutes. 3. Pour a few drops of oil around dosa to let it crisp up. Use remaining egg to make another egg dosa.